The U.S. Army Corps of Engineers is getting ready to make some noise at Isabella Dam. The agency responsible for the multi-year safety project designed to fix weaknesses and deficiencies identified at the earthen dam has plans this fall to use explosives to carve out room for a new emergency spillway. 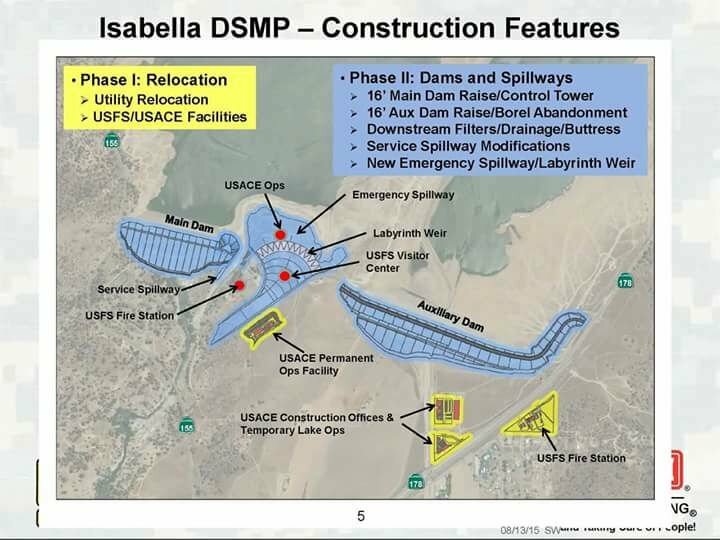 Blasting at Isabella Dam is expected to begin next month to allow for the construction of a news and much larger emergency spillway, to prepare for what corps officials have referred to as a possible but exceedingly rare "Noah's flood" event. Engineers will eventually raise the height of the two dams by 16 feet to contain such a flood. This timeline provides a sketch of when various work will be done on the Isabella Dam Safety Modification Project. It may seem like a long wait, but repair plans are about to get serious as the Corps' construction contractor Flatiron/Dragados/Sukut JV gears up to begin blasting — using explosives to gouge out huge chunks of solid rock from between the auxiliary dam and the main dam. "We basically have to carve a trench out of solid granite," said project spokesman Rick Brown. All in preparation for the construction of a new and much larger emergency spillway. The Corps of Engineers and Flatiron will host public meetings Tuesday evening in Lake Isabella and Wednesday evening in Kernville to outline the schedule and intent of the blasting operations and to discuss the overall status of the Isabella Dam Safety Modification Project. Both meetings will be held from 6 p.m. to 7 p.m., with Tuesday's at the Kern River Valley Veterans Center in Lake Isabella and Wednesday's meeting at the Kernville Community Hall. The Corps of Engineers team members will provide a brief project update and answer questions about topics unrelated to blasting operations. The contractor will lead discussion of the blasting operations, but Brown was able to share the basics Monday. The initial blasting, slated to begin in mid-November, will be "test blasting," Brown said, which will "help form a safety zone" by determining the blast perimeter. "Production blasting," getting serious about moving rock, could begin in December or January, but there's no sure timetable. However, blasting will not occur on holidays or weekends, only on weekdays, Brown said. And officials hope to limit use of explosives even further, to midday Tuesdays and Thursdays, although they can't make any promises. When blasting occurs, nearby residents may feel a tremor in the ground and see a minor dust cloud. "They place blast blankets over the blast area to minimize flying rock or debris," Brown said. The covers also reduce noise and dust. But the intermittent thuds and cracking sounds could last up to a year. "It's going to be ongoing," Brown said. Engineers have figured out a way to use materials excavated during the construction of the spillway for buttresses designed to stabilize the dam. The change negates the need to move hundreds of truckloads of rock and soil from the Southlake area. Repairs to the 65-year-old dam, located on the Kern River about 42 miles upstream from Bakersfield, are scheduled to be completed in 2022.